Peter Randall-Page was born in the UK in 1954 and studied sculpture at Bath Academy of Art from 1973–77. During the past 30 years he has gained an international reputation through his sculpture, drawings and prints. He has undertaken numerous large-scale commissions and exhibited widely. His work is held in public and private collections throughout the world including Australia, Eire, Germany, Italy, Japan, Netherlands, USA, Spain, South Korea and Turkey. A selection of his public sculptures can be found in many urban and rural locations throughout the UK including London, Edinburgh, Manchester, Bristol, Oxford, Cambridge and The Eden Project, Cornwall. He is represented in the permanent collections of the Tate Gallery, Victoria & Albert Museum and the British Museum. Peter is the recipient of many honorary doctorates and awards and was elected as a Royal Academician in the category of Sculpture in June 2015. Born in 1962, Bialystok, Poland. 1982 graduated from the Fine Arts Lyceum, Suprasl, specialising in fine art tapestry. 1987 obtained an MA in sculpture having specialised in medallic art under Professor Zofia Demkowska at the Academy of Fine Arts, Warsaw. 1988 moves to London. 1988-89 completed a Contemporary Art Medal Course at the Royal College of Art. 1997-98 solo exhibition ‘Traces of Feelings’ shown at the Alfons Karny Sculpture Museum, Bialystok and Museum of Medallic Art, Wroclaw. 2001 showed work amongst the Sculpture Collection at the Victoria and Albert Museum in the solo exhibition ‘Recall’. She has won numerous medal and coin design competitions notably the British Art Medal Society President’s medal and a five pound crown to commemorate Queen Elizabeth’s II 80th birthday. Work can be found in many private and national collections including Museum of Medallic Art, Wroclaw and Alfons Karny Sculpture Museum, Bialystok; Museum Beelden aan Zee, Scheveningen, The Netherlands; The British Museum, V&A Museum and The Goldsmiths’ Company Collection, London; The Hunterian Museum, Glasgow and The Royal Collection. Shoko Taruma was born in Hiroshima in 1991 (she now resides in Kyoto) receiving her M.A. in Kyoto City University of Arts in 2016. Taruma #39;s work uses abstract sculpture to embody human existence; in each piece, one life caught in time – organic stasis. 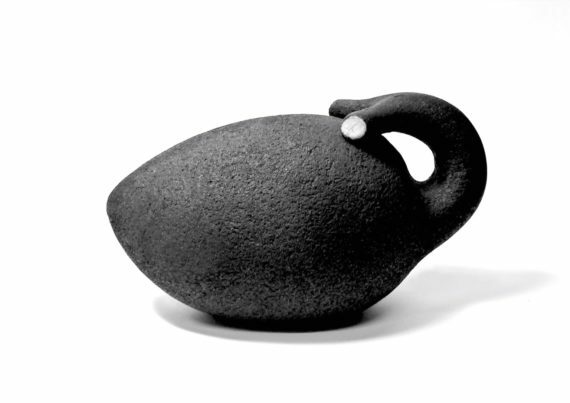 The simplicity of her ideas is found in a Japanese aesthetic of deep natural black and immaculate form.